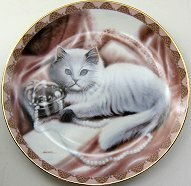 This collector's plate featuring a white cat is the second issue in the Soft Elegance series from the Bradford Exchange. Made of hand-fired porcelain with a gold rim, this limited edition cat plate is for decorative use only. The plate is 8" in diameter. Design is by Ron Iverson, copyright 1994. Previously owned but new condition.